Paper nest affixed to a robust aloe in Kitale, Kenya, 2014. The newest paper cells at upper right contain each a single white egg. The next tier down have partly grown larvae (grubs) that receive chewed up food (mostly insect prey). Next tier down again have fat, nearly mature larvae. 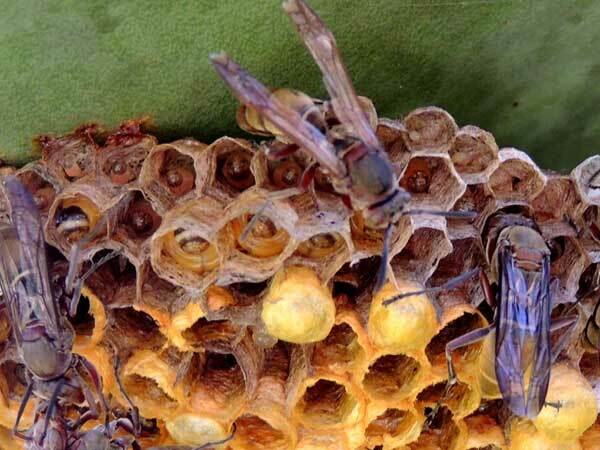 Then the bottom tier in this photo are cells covered over with golden silk; these are cocoons containing pupae that will soon hatch new adult wasps that will join their sisters in laboring to grow the colony. 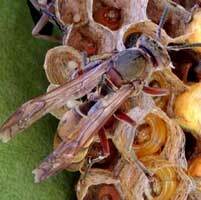 Paper wasps construct nests from paper that the workers produce using chewed wood and salivary secretions. To keep the nests dry and the developing larvae and pupae dry and safe the nests are often built in the protected areas beneath eaves and other overhangs on human dwellings. The adults wasps prey on insects and also bring nectar and pollen from flowers to feed the young within the papery cells. This species apparently is tolerant of human activity nearby and thus may be seen as beneficial because of the many caterpillars and other insects consumed. Copyright Michael J. Plagens, Page created 14 June 2014.